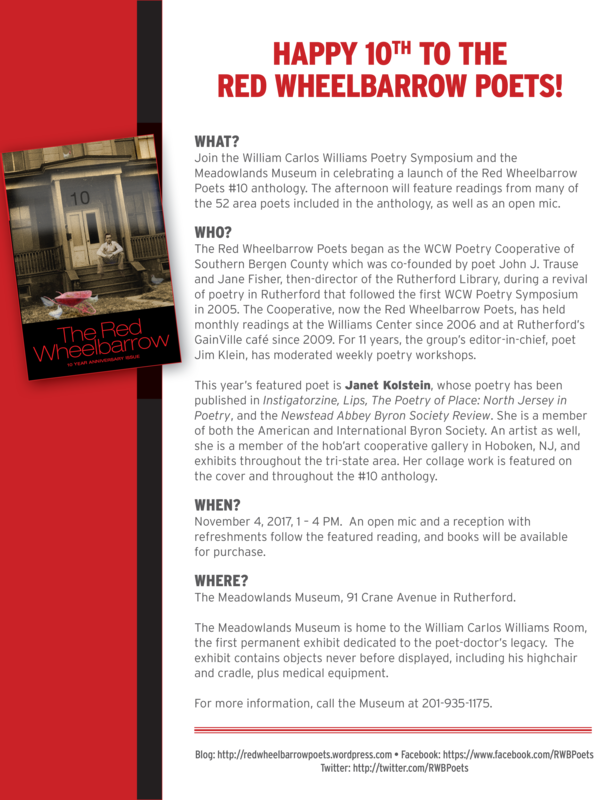 Join the William Carlos Williams Poetry Symposium and the Meadowlands Museum in celebrating a launch of the Red Wheelbarrow Poets #10 anthology. The afternoon will feature readings from many of the 52 area poets included in the anthology, as well as an open mic. The Red Wheelbarrow Poets began as the WCW Poetry Cooperative of Southern Bergen County which was cofounded by poet John J. Trause Janet Kolstein, whose poetry has been Instigatorzine, Lips, The Poetry of Place: North Jersey in Poetry, and the Newstead Abbey Byron Society Review. She is a member of both the American and International Byron Society. An artist as well, she is a member of the hob’art cooperative gallery in Hoboken, NJ, and exhibits throughout the tristate area. Her collage work is featured on the cover and throughout the #10 anthology. November 4, 2017, 1 – 4 PM. An open mic and a reception with refreshments follow the featured reading, and books will be available for purchase. The Meadowlands Museum, 91 Crane Avenue in Rutherford. The Meadowlands Museum is home to the William Carlos Williams Room, the first permanent exhibit dedicated to the poetdoctor’s legacy. The exhibit contains objects never before displayed, including his highchair and cradle, plus medical equipment. For more information, call the Museum at 2019351175.